We at Tongil Tours strongly believe in the need for increased cross-cultural understanding between North Korea and the West. We seek to leverage our unique assets– our in-country connections and academic knowledge of the Korean language and culture –to organise and promote projects aimed at increasing academic and cultural exchange with North Korea. See below for some examples of such projects.If you have an idea for such an academic or cultural exchange project, whether you be a student or an academic, an artist, filmmaker, musician, sportsperson or businessperson, we would be most happy to help! Please contact us with your idea. In July/August 2016 we organised the first ever open program for foreign students to study Korean language in a North Korean university. We hosted the three-week program at the Korean Language Faculty of Kim Hyong Jik University of Education (김형직사범대학; 金亨稷師範大學) in Pyongyang, and catered to beginners, intermediate and advanced levels of Korean language ability. Among our cohort were the first ever Australian and first ever US citizen to study in a North Korean university. I Was The First Australian To Study In North Korea– Blog post in Huffington Post Australia by Tongil Tours founding partner Alek Sigley who organised and participated in the program. The first Australian student in North Korea shares his story— ABC News Radio interview with Tongil Tours founding partner Alek Sigley on his experiences of the program. NKNews interviews Tongil Tours founding partner Alek Sigley about the program. Tongil Tours blog post on the inaugural 2016 program. A student from the United States learns beginners Korean at Kim Hyong Jik University of Education. 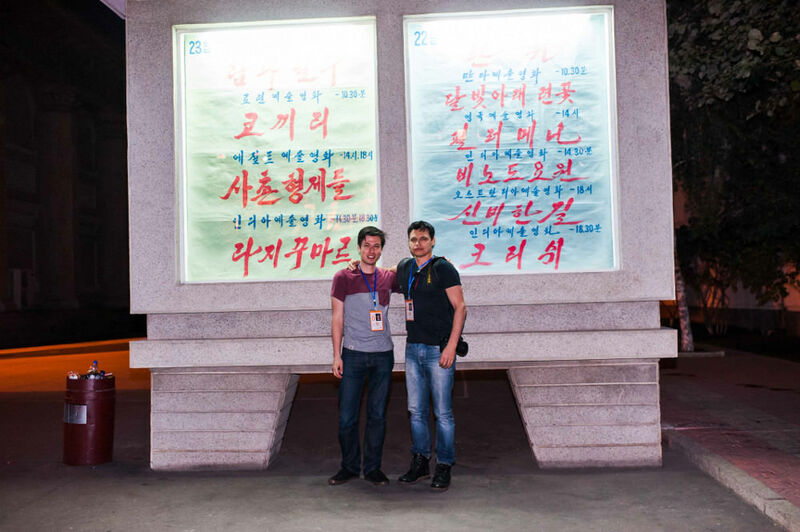 Tongil Tours facilitated the screenings of two Australian independent films, The Rocket and Mystery Road, at the 14th Pyongyang International Film Festival in September 2014. We brought director of Mystery Road Ivan Sen with us to the festival and viewed Mystery Road alongside a packed and excited local audience in Pyongyang. North Korea and Western films do mix— Oped in the ABC’s The Drum by Tongil Tours founding partner Alek Sigley on the experience. North Korea film festival screens Indigenous-Australian film ‘Mystery Road’, sells out— Piece in SBS news on the project with interviews with Tongil Tours founding partner Alek Sigley and director of Mystery Road Ivan Sen.
Tongil Tours founding partner Alek Sigley with director of Mystery Road Ivan Sen in front of a board listing the screening of Mystery Road at Taedongmun Cinema, Pyongyang.